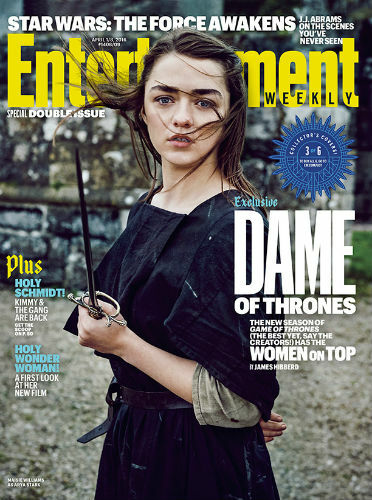 -All of the Game of Thrones covers EW is running are great, but I’m going to be super bummed if I don’t get Arya or Brienne in my mailbox tomorrow. -Despite what everyone was reporting this morning, Jon Lovitz is NOT engaged to 90210 star Jessica Lowndes. It was just a publicity stunt for her new music video. A really creepy publicity stunt. -Did Lady Gaga celebrate her 30th bday as a married lady? -Another teaser for Unbreakable Kimmy Schmidt has landed. This show makes me stupid happy. -This is pretty wonderful: Judd Apatow, Kevin Nealon, Kathy Griffin and more honoured Garry Shandling with a pickup basketball game, which he used to host weekly. -Arrow’s Emily Bett Rickards and Colton Haynes made a very silly dance routine to Taylor Swift‘s “Shake It Off” which sounds exactly like something my friends and I would do. We just wouldn’t post it to YouTube. Bless them. –Robert De Niro ended up pulling that anti-vaxx doc from the Tribeca Film Festival. I love how @NYTHealth tweetstormed the crap out of it. –Jennifer Lopez is going to be a guest on James Corden’s new Carpool Karaoke show. Here for it. -I was trying to explain to my coworkers why I didn’t hate Batman V Superman as much as I thought I would, but then I realized that everything I was mentioning was a negative (with the exception of Affleck‘s performance). I also realized pretty quickly that I couldn’t explain any single character’s motivations for anything that they did. Like, what exactly was Lex Luthor’s plan?! -Even Michael Shannon, who is in Batman V Superman, could not possibly care less about the clash between Batman and Superman. –Alec Baldwin was the first choice to play Mr Big on SATC? Just….no. -Another TMNT 2 trailer that kind of makes me want to see it. I don’t understand life. –Ryan Gosling and Russell Crowe ham it up in the Nice Guys trailer.